Asylum assessment under Rudd: tough, or just shonky? 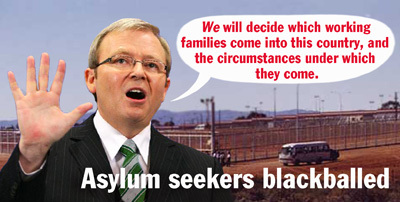 Is Rudd's asylum seeker policy tough, or is it just shonky? It's great that John Howard, that prime vilifier of asylum seekers, has left the prime political scene of Australia. Howard was replaced by Kevin Rudd, who's amicable, intelligent, and also 'smart' in the political sense. But at Project SafeCom, we've never believed that the treatment of refugees and asylum seekers would change overnight. Below is the early evidence of rather disturbing information coming in the form of a report from Melbourne's Asylum Seeker Resource Centre, as reported by Crikey. The analysis of the rejections is contained in a document distributed to volunteers by the Asylum Seekers' Resource Centre, which is the leading aid and advocacy organisation for refugees in Australia. Read the whole document here. "It's still too early to get a complete picture of how the Minister will exercise his power, however it's sadly looking like a change of government may have brought no real change for asylum seekers." He said the ministerial discretion, intended as a check on the system, had instead become part of the process. Different personalities and priorities among Immigration Ministers led to different outcomes. He indicated he favoured arms' length decision making by better supported tribunals. Meanwhile, Crikey sent a copy of the Asylum Seeker Resource Centre document to the Minister's staff yesterday afternoon, but did not receive comment in time for today's deadline. A few minutes ago, an asylum seeker was given the bad news that he had been rejected. An ambulance has just taken himto hospital becasue he attempted to kill himself. He is unable to face return to the country from which he fled. THE Rudd government is rejecting asylum seeker applications at a higher rate than the Howard government, according to an analysis of new figures. An Asylum Seeker Research Centre (ASRC) report says the immigration department has knocked back 41 of the 42 cases it has had referred to it since Labor took power after the November 2007 election, a rejection rate of 97.6 per cent. The report, authored by ASRC chief executive Kon Karapanagiotidis, says that is the highest rejection rate since the Victoria-based ASRC started in 2001. ASRC community campaign coordinator Pamela Curr conceded some of the 42 did not have compelling cases, but said others certainly did. "There is no way you can look at some of these cases and, with the guidelines for ministerial decision making, reject them," Ms Curr said. "We don't have the figures yet from other advocacy agencies but we know this is going on all around Australia." Ms Curr said wrong decisions were being made because of Immigration Minister Chris Evans' emphasis on clearing backlogs and making decisions more quickly. She said the figures made a mockery of Senator Evans' assurance that he would bring humanity back to the immigration portfolio. "I think that this government is absolutely dead scared on the refugee issue, after all they lost an election on this back in 2001," she said. "Now they're in power, they've got a wonderful majority, they've got the country behind them but they're too gutless to tackle the hard issues." Ian Rintoul of the Refugee Action Coalition said he believed the promise of a new dawn in immigration was not being delivered. "I think the minister is still paying too much attention to the immigration department rather than trying to implement the cultural change that was promised," he said. Mr Karapanagiotidis said while it was too early to form a complete picture of Senator Evans' approach, it was looking as if the change in government had not brought change for asylum seekers. Jack Smit from refugee advocacy group Project SafeCom called the figures "disturbing". The ASRC claims to be the largest provider of aid, advocacy and health services for asylum seekers in Australia. Comment was being sought from the minister's office. The Asylum Seeker Resource Centre believes it is inappropriate and unjust for the Minister for Immigration and Citizenship to continue making decisions under a refugee and humanitarian system he has acknowledged is flawed and has committed to overhauling. The Minister has made so far 730 decisions under this faulty system. The Minister has explicitly stated that he is wrestling with the very issue of Ministerial power, stating that "ministerial intervention offers no guarantee of fairness. There is no way of really knowing what factors influence the minister's decision in individual cases. And there is no avenue of appeal from a bad decision, and no way to prevent an abuse of power. There is no consistency in the decision making because different ministers have different personalities and different ways of thinking." Yet whilst the Minister expressly states this, he is still using these very powers, which he has condemned as flawed, unaccountable and untenable. In the absence of a complimentary system of protection, Ministerial intervention is currently the only check that remains in our immigration system for people who have been found not to be refugees. It is internationally accepted that the Refugee Convention and law does not accommodate all compelling humanitarian cases. Whilst it is accepted that not all cases merit a Ministerial intervention we are concerned that those cases, which do, are being refused by the Minister under the current system. All of the following clients have compelling humanitarian cases and the fact that they have all been refused highlights the serious failures within our existing refugee system. They are among 42 out of 43 ASRC cases that the Minister has refused so far. This is the highest refusal rate which the ASRC has faced under any Minister for Immigration. These cases fall within the following patterns: a disregard for Australian family units of which these people are part; risk of returning people who have been tortured to their countries of origin and a disregard of serious psychological and physical ill- health. A family from a persecuted ethnic minority in the Ukraine whose 6-year - old daughter was born in Australia and where a suicide risk was flagged for the father. Yesterday, upon being told of his recent Ministerial refusal he attempted suicide at the ASRC in front of his son. A 63 year-old East Timorese woman with a large extended family in Australia including her sister, two children and grandchildren who due to the violence in her country has not been able to locate her remaining family in East Timor. The ASRC calls on this government to stop making Ministerial decisions until an appropriate overhaul of the system is in place and to fix our refugee system. Five minutes after yesterday's Crikey story about the Rudd Government's rejection of asylum seekers was published, a client of the Asylum Seeker Resource Centre in Melbourne was told that his application for ministerial intervention had been refused. He had come into the Centre to see his lawyer. He went downstairs and attempted suicide. An ambulance took him to hospital. This is the front line of the experiences under the present push to clear a backlog of requests for ministerial intervention in asylum seeker cases. We run more reports from the front line today [below]. Our story yesterday was about an analysis of the use of Ministerial discretions for asylum seekers under the new Rudd Government. Figures from the Victorian-based Asylum Seeker Resource Centre suggested that new Minister Chris Evans was being tougher than his predecessors, rejecting more than 97% of cases. After deadline yesterday the Minister's office got back to us with a response. Read the whole media release here. The heart of the Minister's reply is a claim that the Asylum Seeker Resource Centre's figures are not representative of the way in which he is using his discretion. Evans claims to have considered using his powers in "some 730 cases", of which he has intervened in 170 cases. These figures have caused puzzlement in refugee advocacy organisations this morning, because this number of decisions is "nowhere" on their books. A ring around has established that the Asylum Seeker Resource Centre has the largest number of decisions, with the 42 cases on which their analysis was based. Precise figures are not yet available, but it is clear that the totals of decisions received around the nation don't come anywhere near 730. It is possible that many decisions are still in the pipeline and the applicants have not yet been notified. But refugee advocates suspect the Minister's figuring includes decisions made under the quite different Section 351 of the Migration Act, which concerns ministerial intervention for people who are not refugees, as well as the more contentious Section 417 decisions, which are about asylum seekers. Crikey has sent questions to the Minister to try and clarify this point, but has not received a response by deadline. It should be taken into account that Evans and his staff are presently in Perth and several hours behind us in time, and our deadlines are punishing for all concerned. We will run his response in full when we receive it. What we do know is that in New South Wales, there have recently been Ministerial decisions concerning 62 long-term detainees in Villawood detention centre. All the requests for Ministerial intervention have been rejected. Figures for asylum seekers presently in the community are harder to obtain. The Minister's media release also repeats a view he has expressed previously - that Ministerial discretions are overused. "The industry which has developed around Ministerial intervention is detrimental to the entire immigration system. Many now see Ministerial intervention as a third tier of review, rather than as a check on the system," Senator Evans says. "Thousands of requests for Ministerial intervention are received each year, most of which are not the unique and exceptional cases that the relevant powers were intended to address." This may well be right. It was former Minister Philip Ruddock who caused the big spike in use of the ministerial discretion in refugee cases, and there was lots of controversy about how he used it. It is also true that those who come to the Minister for a decision have already been rejected by the department, the tribunals and often the courts. And yet refugee advocacy groups claim the present rush of rejections include people who have suffered torture in their home lands, and who fear harm if they are returned to their countries of origin. Advocates admit that not all applications to the Minister are strong cases - but they say many of those being rejected are compelling. Evans' media release also points out the good things the new Government plans to do for refugees - such as ending the Temporary Protection Visa regime. Here are the questions Crikey has today sent to the Minister. We will run his response in full when received. Concerning the 730 cases and the 170 interventions mentioned in yesterday's e-mail, can you please clarify whether these are all requests for Ministerial intervention under Section 417 of the Migration Act? The reason for the question is that a ring around of refugee advocacy groups this morning has revealed that this number of decisions is "nowhere" on their books. They suspect that these figures include decisions made by the Minister under Section 351, which does not concern refugees. How many decisions in total has the Minister made under Section 417 since taking office, and what is the breakdown of decisions? The media release states: "This transparency will extend to providing better information in relation to the exercise of Ministerial discretions, and work on this is well underway." What exactly is planned here? What information will be provided, and to whom? When will Temporary Protection Visas be abolished? The government has promised to give refugees work rights and Medicare rights. That has not happened yet. Why not, and when can it be expected? I and two other ASRC lawyers, Maria and Sam spent the entire day telling 19 families that the Minister had said no to their case and that for most they now had to face going home. I can still hear the weeping of one young woman from Ethiopia after hearing the news of her rejection. Having fled being trafficked and raped, the news left her sobbing so loudly that she started wailing and screaming. It pierced the walls and stopped us all. It took an hour just for the tears to stop. What comfort could I give her? We sat with the father from Sri Lanka who is married to an Australian and has a child with her and tried to explain why this government wants to break up his family and send him home. We could find no reason. The father of one of our families who has been here 11 years rang a counsellor on the weekend (after we broke the news to him on Friday) threatening to throw himself off a bridge because the thought of return was too much to bear. Next week, we face yet another 8 people whom we must tell that they must return. I am already thinking about one father who has already tried killing himself, that I must give the news to this week and have to somehow convince him to stay strong for his 2 kids who need their dad. I worry for the young man from India who faces torture if he returns simply because he is gay. We will continue to fight the good fight for those in danger, and for those who may seek to kill themselves rather than face return and for those whose families are on the line. But as I sit tonight at 8.39pm writing to you, I ask myself why do our people have to suffer so needlessly, so unjustly, so immorally, simply because they want freedom? Figures used by the Minister for Immigration to rebut claims he is tougher on asylum seekers than his Howard Government predecessors include cases that don't relate to asylum seekers at all. The Minister says the "vast majority" are asylum seeker cases, but he has not been able to provide a breakdown. "This is disturbingly like the sort of spin we have seen through successive Immigration Ministers. Give us the figures and give us the truth." Before we go on, we promised to run in full the Minister's response to Crikey's questions. In fairness we don't want to bury this, so they are published at the bottom of this story. Meanwhile the CEO of the ASRC, Kon Karapanagiotidis, has called on Evans to stop making Ministerial decisions until he has overhauled the system - which Evans has in the past described as flawed, unaccountable and inconsistent. "Yet whilst the Minister expressly states this, he is still using these very powers," Karapanagiotidis says. This saga began when Crikey ran this story on Wednesday detailing an analysis of 42 decisions by Evans on requests for his intervention under Section 417 of the Migration Act. This section deals with asylum seeker cases. Senator Evans responded by claiming the figures were not representative. In this media release he said he had considered 730 requests for his intervention, and intervened in 170. As we reported yesterday these figures surprised refugee advocates, because there are nothing like 730 decided cases on their books. In response to questions from Crikey, the Minister said yesterday that the 730 figure included all cases in which he had considered the use of his discretionary powers. That means the figures included requests under sections of the Migration Act that do not relate to refugees. Senator Evans said "the bulk" of the cases were under Section 417. Later his spokesmen said the "vast majority" were Section 417, but that a breakdown was not easily available. The Senator says that in some of the cases where he has intervened, he has sought more information. Other cases have been decided, but the applicants have not yet been informed of the decision. He says he has committed to providing statistical information on his use of the ministerial discretion on a quarterly basis. Meanwhile, another refugee advocacy group, A Just Australia, has accused Senator Evans of deliberate misrepresentation when he claims that people seeking Ministerial Intervention have already been found not to be owed protection. "Australia has protection obligations under more than just the Refugee Convention. Ministerial Intervention is the only point at which asylum seekers' claims for protection under instruments such as the Convention Against Torture [CAT] are reviewed," said National Coordinator, Kate Gauthier. "To say that people seeking Ministerial Intervention have already been found not to be owed protection is a deliberate misrepresentation of the facts." "A Just Australia agrees with the Government that Ministerial Intervention needs a major overhaul. The Minister commissioned an external report into the system earlier this year, but there was no external consultation and the findings of that report have yet to be made public. So far there has been no commitment to make that review open and transparent to the Australian people, which is the problem with Ministerial Intervention in the first place." Read the whole media release from A Just Australia here. Senator Evans' spokesperson has told Crikey that the quarterly figures on ministerial intervention will be released "very soon". Elsewhere today we list some of the cases that Evans has recently rejected. "The figures provided yesterday relate to the number of cases in which I considered the exercise of my discretionary powers. The bulk of the cases were decisions under Section 417 of the Migration Act. "In some of those cases, I have requested more information and there are others on which decisions have been made but not yet communicated by the department to the applicants. "It must be stressed that all of these cases involve people who have been assessed by the department, the Refugee Review Tribunal and, in some cases, the courts and have been found not to be in need of Australia's protection. "I have committed to providing statistical information on Ministerial Interventions on a quarterly basis. "The Labor Government will also deliver on its commitment to abolish temporary protection visas. We have also acknowledged the need for a bridging visa regime that is much more coherent and compassionate than is currently in place. "The Rudd Government will pursue the issue of work rights and Medicare benefits for asylum seekers on bridging visas carefully and methodically as part of a broader, bridging visa policy framework. "The Rudd Government's aim is to ensure that immigration decisions are made fairly and promptly." Asylum seekers should be granted an amnesty while the system is reviewed. LAST week's federal budget signalled the abolition of the Temporary Protection Visa system, introduced by the Howard government in October 1999. Since then 11,000 asylum seekers have received this visa. The TPV system was cruel and unjust. It undermined the spirit of international conventions for the protection of refugees. TPV holders were deprived of travel rights, given little access to settlement services, and could not be reunited with family members. People who had fled from persecution in their homelands were condemned to years of mental anguish and uncertainty. With each passing month the agony of indefinite separation from family increased and drove many to the brink of madness. As one asylum seeker put it, the visa reduced him to "a nothing, a nobody". So inflexible was the system, that when Iraqi asylum seeker Sondas Ismael lost three young daughters in the SIEV X boat tragedy on October 19, 2001, her husband, Ahmed al-Zalimi, could not travel from Sydney to Indonesia to be with his grieving wife. The Rudd Government and Immigration Minister Chris Evans have righted a great wrong. The final 1000 asylum seekers on TPVs can now put their past behind them and rebuild their lives. But the process of restoring basic human rights to asylum seekers is not quite over. The refugee determination system is in need of urgent reform, particularly the 417 ministerial intervention process for asylum seekers who have been refused visas on their refugee claims but have a humanitarian claim. Senator Evans is the final arbiter of these cases. His decision is non-compellable and non-reviewable, and can result in imminent deportation. There are 2000 such cases being considered. He has said that the system is flawed and that he does not want "to play God". It is currently under review and will most likely be overhauled, yet the minister continues to make decisions on outstanding cases. According to the Refugee Council of Australia, he has intervened in about 15% to 20% of cases, although some member agencies claim the figure is far less. The Asylum Seeker Resource Centre in West Melbourne has had 42 out of 43 claims rejected within five weeks. Centre chief executive Kon Karapanagiotidis says that among them are people who have suffered torture, violence, trafficking and mental illness. Many fear for their safety if returned to their countries of origin. Some have been here 10 years or more, others have Australian children and Australian spouses, and will be permanently separated from them if deported. Some are too damaged to go back to countries where they have no one to care for them, or will face death and persecution upon return. Representative claims that have been rejected include a young woman from Ethiopia who was trafficked, enslaved by her employer and subjected to horrific abuse. There is a young Kurdish man from Turkey who had been detained and tortured in his home country, and who may be tortured upon return. There is an elderly couple from East Timor, with eight of their nine children living in Australia, who fled violence and who would be destitute if deported. There is a man from China who was a member of an underground Christian church, and faces detention and torture upon return; and a Sri Lankan father who has been in Australia for 10 years, whose immediate family are Australian residents, and whose wife's two brothers and parents were killed during the tsunami in 2004. Karapanagiotidis argues that no decisions should be made under the current system while it is under review, because people's lives are in the balance. He points out that many 417 applications are "legacy cases" left over from successive ministers in the previous government. After years of waiting and rejections, those seeking visas are falling apart, and terrified of being deported. There is another way to break the deadlock and release individuals from years of uncertainty: an act of humanity or an amnesty that would short-circuit the backlog of unresolved cases. Refugee advocates who have to tell clients of their rejections regularly witness the tragic impact of the process. "Their faces crumble before your eyes," Karapanagiotidis says. "It is like watching the life force draining out of them. They become living ghosts." Just weeks ago a father, whose family is from a persecuted ethnic minority in a country that cannot be named, attempted suicide in front of his son at the Asylum Seeker Resource Centre when told of his rejection. There is a saying in the Talmud that saving one person's life is equivalent to saving a universe. An amnesty would resolve all outstanding cases while the review is in progress, and assist in facilitating a culture change in the Immigration Department. It would enable the Rudd Government to wipe the slate clean and start anew with a fair and humane system, in keeping with international obligations, and with provisions for people who have humanitarian protection needs. It would help end a dark chapter in our treatment of asylum seekers. It would end the agony, and save lives. Arnold Zable is a Melbourne writer who has depicted the journeys of refugees in novels, columns, essays and news articles for 30 years.